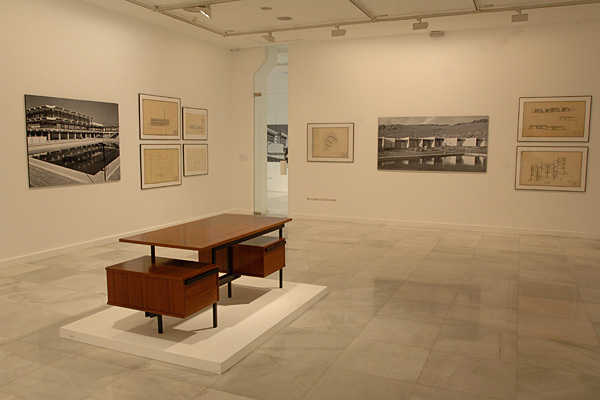 "STRUCTURALISM AND EXPERIMENTATION IN THE ARCHITECTURE OF THE 60S"
"Estructuralismo y experimentación en la arquitectura de los años 60"
On the right Manuel Millares’ work. 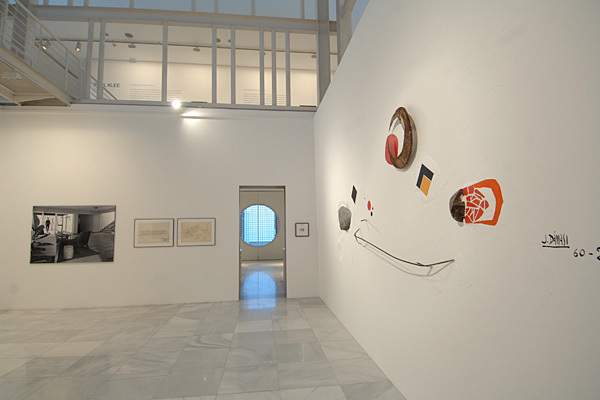 "Centro Atlántico de Arte Moderno CAAM"
On the right José Dámaso’s work. Organised by: Centro Atlántico de Arte Moderno. CAAM. From 5th October to 5th January 2008, the Centro Atlántico de Arte Moderno (CAAM) in Las Palmas de Gran Canaria presents the Manuel de la Peña. 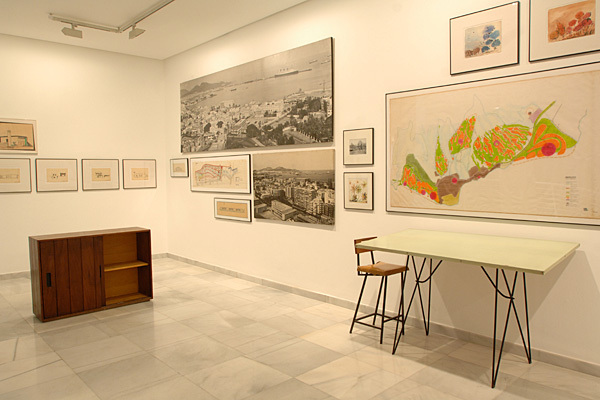 Structuralism and experimentation in the architecture of the 60s exhibition in which the CAAM wishes to show the importance of modernity in the culture of Las Palmas de Gran Canaria during the 20th century, particularly in fields related to architecture. It therefore shows proposals which, from 1955 on, approach the regeneration of the dominant styles, coinciding with the mobilisation of a new generation of architects arising all over Spain to actively build bridges with the international currents of a second modernity. Although the work of architect Manuel de la Peña (Madrid, 1922) earned nationwide renown from his very first projects, published in architectural magazines, distance won the battle and his fame lasted but a few years. It was difficult for national theorists to access his buildings and the underlying oblivion created by distance ultimately removed him from the restricted circle of emerging architects in the era of development which was to transform both our lifestyle and the urban landscape. In a broad analysis of the architecture of the second modernity, the figure of Manuel de la Peña is clearly outstanding, due to both the quantity and variety of his projects. This was largely due to the expressive and plastic capacity he had fostered during his training and, in particular, during the time he was close to a personality as important as Casto Fernández Show, with whom he shared a permanent interest in experimentation or the rebellion of discontinuous thought. Ultimately, De la Peña, like Miguel Martín in the historic avant garde period, represents a milestone in our national culture. Manuel de la Peña is the architect who most decisively fostered this regeneration in Las Palmas de Gran Canaria, and as soon as he signed his first project in 1958, he revolutionised the aesthetic structures of leading local architects. The masterpiece of the Hotel Las Palmeras was and, in spite of the changes made, continues to be a cultural milestone which has never been completely understood and accepted by professional sectors and society in general, in contrast with its attraction and interest for architectural specialists seeing it for the first time. Besides this building, however, De la Peña worked a great deal with all kinds of architecture, such as urban, religious, tourist and agricultural and even town planning. This is worth remembering, as in any circumstance, his work shows evidence of the versatility of his designs and the economic efficacy of each project. Supplementary to his architecture, we must remember the furniture he designed for his buildings and also produced and sold in a local shop, creating a market which would be a point of reference for the latest trends for years. He established a relationship between architecture and design in order to illustrate the spatial idea with which the architect designed his buildings. Tables, chairs, doors, stools, sideboards, shelves… add volume and colour to the exhibition in a tactile component as subtle as it is tense between form and structure. Manuel de la Peña (Madrid, 1922) graduated as an architect in 1951 and, after his first projects were published in Cortijos y Rascacielos magazine, edited by Casto Fernández Show, with whom he collaborated in a professional capacity, he sat the exams to join the recently created National Housing Institute, which transferred him to Santa Cruz de Tenerife in January 1956. The lack of structure of the new ministerial department in the Canary Islands also led him to become a member of the Provincial Housing Board of Las Palmas in representation of the Directorate General of Architecture and, two years later, he became the Architect in chief of the Housing Section of the province of Las Palmas, where he lives from 1958 on. His private professional activity started that same year and lent his decisive seal to the evolution of local architecture with an informal approach of great formal austerity, comparable to the dominant aesthetics in the new specific housing service which combined the cultural advances of the youngest architects in the country. But the architect also has an experimental orientation which was only seen in a few completed projects and which was finally revealed in numerous sketches and projects which failed to survive the paper stage and would have given contemporaneousness a different landscape. 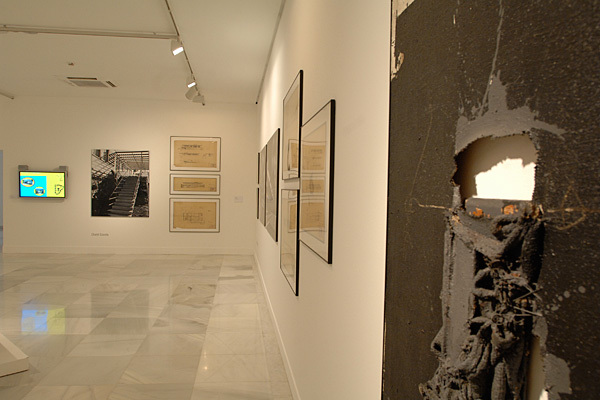 The exhibition will be curated by José Luis Gago Vaquero, a doctorate architect and teacher at the San Fernando Fine Arts School (Real de Bellas Artes de San Fernando), Madrid. He was also the Director of the Vivir Vegueta School of Restoration in Las Palmas de Gran Canaria and guest professor at the following institutions: the Moscow Institute of Architecture, the Moscow Academy of Restoration, Hogeschool Midden-Bravant, Tilburg and the Syracuse School of Architecture, New York. His exhibitions, publications and other work include: Latest Canary Island Architecture (2004), Lpgc Contemporary Architectures 1960-2000 (2002), Juan Marquez. Rationalist Furniture. 1933–1938 (2001), Juan Marquez. Press articles. 1952-1963 (2001), Unease of New Canary Island Architecture (2000), Miguel Martín. Architectures for the City (1994), Vivir Vegueta (1994), The City of Las Palmas and The Modernist Culture (1989), Architecture and The Architects of the “Ensanche” 1920-1950 (1986) and Architecture 81 (1981). He received the Manuel de Oraá Architecture Award. The exhibition also includes furniture designed by Manuel de la Peña and the work of artists who collaborated with the architect in his projects: (Martín Chirino, Pepe Dámaso, Juan Antonio Giraldo, Manolo Millares). Finally, it also includes personal objects belonging to the architect – such as his desk, coloured sketches of housing estates, photographs and drawings. A bilingual catalogue will be edited (Spanish-English) including over 400 pictures. The illustrations will include reproductions of the original sketches, plans and photographs of the selected buildings. The text of the catalogue will be written by the curator. It will be a detailed study of the architect’s career and work.